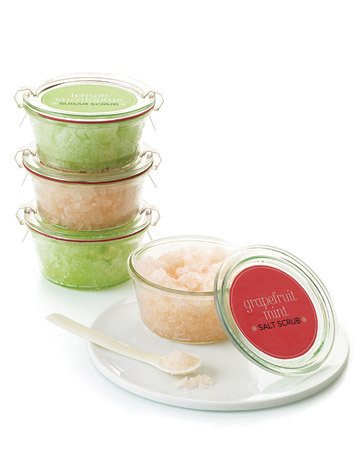 Make Mom her own all-natural body scrub filled with salts, sugar, and lemon zest. How-To:Combine 1 cup of body oil with 2 cups of Epsom or sea salts or organic cane sugar (depending on how fine a grain you like). We added lemon zest for color and fragrance. Package in jars (plastic is safest by the tub). 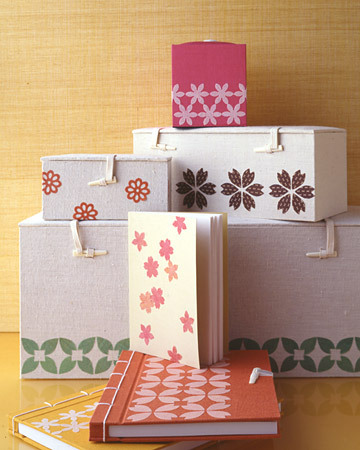 This Mother's Day, make a lasting impression by making and giving mom one of these fabric-covered boxes and journals by using bold, geometric patterns. Transform an old-fashioned Mason jar into your sewer's must-have kit, complete with a built-in pincushion on top. How-To: To begin, separate the lid's sealer and screw cap. Trace around sealer on cardboard. Using a compass, draw another circle on linen or cotton, 1 inch larger in diameter than the first. Cut out both circles; make cushion by placing batting between fabric and cardboard. Turn screw cap upside down, and apply hot glue to inside edge of rim; quickly press cushion into lid until cloth protrudes smoothly above screw cap's opening and cardboard is flush against rim. Apply hot glue around edge of cardboard, fold over excess fabric, and press down. Glue top of sealer to cardboard. Fill jar. Use sleek silhouettes to turn a modest bag into an artful gift for Mom. 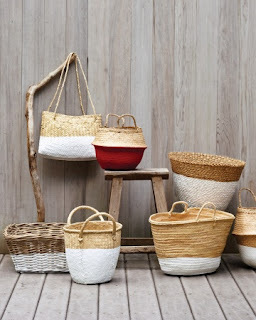 When dipped in paint, rustic baskets become thoroughly modern carryalls that look as if they came straight out of a design shop. If you don't have enough paint to dip large baskets, use a foam brush to apply the paint instead. Treat mom to lemon, lavender, peppermint, and chamomile homemade tub teas. 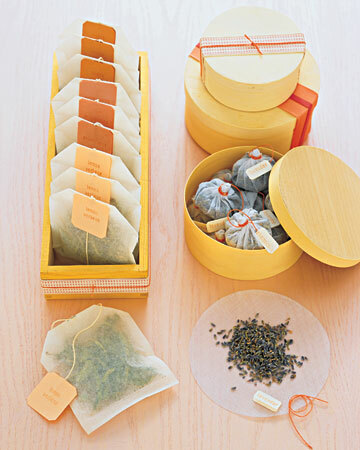 How-To:Fill heat-sealable tea bags (perfect for one bath) with 1/4 cup lemon verbena, lavender, peppermint, or chamomile. 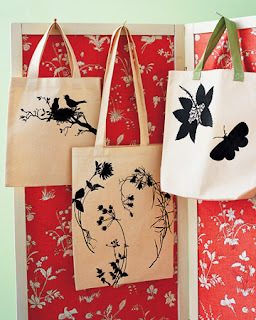 For small bags, top 5 1/4-inch starched muslin circles with 1 tablespoon of botanicals; tie with waxed twine. Giving a few of these in different scents lets bathers customize each bath. 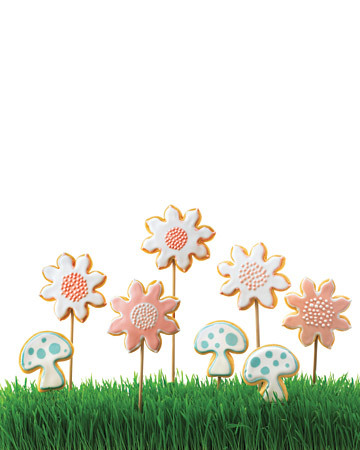 Simple sugar cookies spring to life -- and become a sweet gift for Mother's Day -- when baked on skewers and arranged in a "meadow" of wheatgrass. 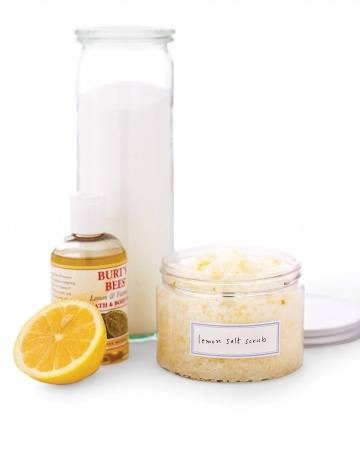 Make Mom a jar or two of exfoliating body scrub using her favorite scents. When you're done, print our clip-art labels to customize your gift. How-To: Stir together Epsom salts or sugar and carrier oil in a bowl, mixing well. Using pipette, add essential oil, 1 drop at a time. Add food coloring, and stir until color is even throughout. Spoon into canning jars. 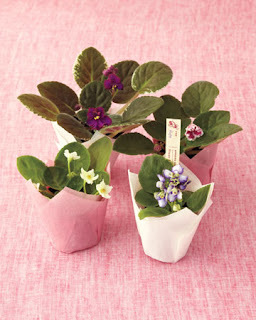 Download clip-art labels, enlarging or reducing to fit top of canning jar if necessary. Print onto ink-jet bumper-sticker paper (which is designed to withstand water). 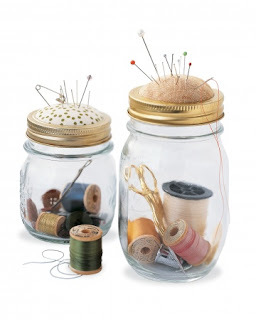 Cut out the labels, and affix to clean jars.Gift-Packaging Idea: With their flip-top lids and gaskets for sealing, canning jars have a clean look and also keep any oil in the scrub from leaking. 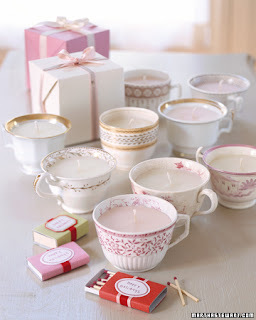 Decorate the jars with labels, and tie a pretty spoon or a bath sponge to the lid with waxed twine. 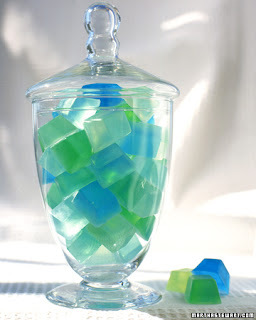 Go ahead -- wash your hands with these pastel ice cubes. They're actually soaps made using an ice cube tray as a mold: a gift for Mom that's pretty as well as practical. How-To: Experiment with ice-cube trays of various shapes and sizes. Glycerin is usually sold in large blocks; to melt it, cut it to a size that will fit in a microwavable bowl or measuring cup. Smear a dab of liquid food coloring into the bowl or measuring cup with a cotton swab or coffee stirrer. Food coloring is very concentrated, so only use a dab; try mixing different colors. Heat the glycerin in a microwave on high, stirring at 15-second intervals, until it's completely melted. Use a cotton swab to coat the inside of the ice-cube tray with petroleum jelly. Pour the melted glycerin into the tray, filling each section almost to the top. Cool for about 2 hours; the soap cubes will pop right out. Like cubes of ice, they'll also melt -- getting gradually smaller as each pair of hands is washed.